Joshua P. Fessel, MD, PhD (right), Vanderbilt University Medical Center, is the first winner of the ATS BEAR (Building Education to Advance Research) Cage competition. Earlier this year, early career investigators submitted research proposals to the ATS BEAR Cage competition, sponsored by the ATS Drug Device Discovery and Development (DDDD) Committee, for a chance to win up to $5,000 at ATS 2015. 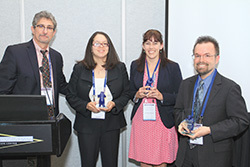 Theodore F. Reiss, MD, MBE, chair of the ATS DDDD Committee, presented the awards to Dr. Fessel for “A Novel System to Detect and Prevent Impending Aspiration—AspirGard IT-NGT,” and the runners-up who received $2,500 each, Laura Crotty-Alexander, MD (second from right), University of California, San Diego, for “Effects of E-Cigarette Vapor on Viability, Inflammatory Responses and Antimicrobial Function of Airway Cells,” and Tiffany M. Powell-Wiley MD, MPH, FAHA, National Heart, Lung, and Blood Institute, for “Tailoring Mobile Health Technology to Neighborhood Environment: A Multilevel, Community-Based Pilot Physical Activity Intervention.” These finalists pitched their highly innovative research proposals to a panel of translational science experts representing academia, industry, and governmental sectors in front of a live audience at the Science & Innovation Center on Sunday.